This recipe uses a mixer but it can all be done by hand in a large bowl. You will need to knead the dough on a work surface until smooth and non sticky before proving. 2. Add the flour, butter, sugar, yeast and salt ensuring that the salt and yeast are on oppsite sides of the bowl. 4. Add the fried fruit and spices and mix again for a couple of minutes until the fruit is incorporated. 9. Beat together your cross paste ingredients until you have a consistency that can be piped - set aside. 10. 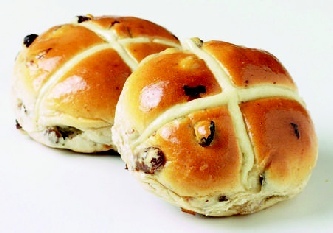 When the buns are ready, brush again with the egg glaze and pipe a cross on the tops. 11. Bake in the oven for 20 mins approx and then cool on a wire rack. 12. Mix the water and sugar together in a small pan, bring to the boil for a few minutes and glaze the top of each bun. 13. Best eaten fresh but can be stored in an airtight tin for 2 - 3 days.